There is an out of the way adventure available to anyone wanting to do a bit of hiking and who isn't afraid to get a little wet or a little dirty north of Toronto near the small little town of Tobermory on the Bruce Peninsula at Cyprus Lake National Park called The Grotto. This natural phenomenon carved during the glacier age of the Great Lakes is a cavern carved out of the rock most popular for it's underwater tunnel leading out into Lake Huron and for years we had been wanting to find the right couple to come with us to take some wedding photos at the mouth of the cave. Getting to this spot is the biggest challenge as we don't really want to get the white dress all dirty before taking pictures and in order to get to this spot you have to scale down a rock face. In this instance the bride chose to bring her dress down with her in a backpack and change into it once she was in the cave which I though was a brilliant idea. I had a vision for this particular photo and had tried it on a number of occasions but was unable to capture it because the water was either too rough or it wasn't the right time of day, but at just the right moment the sun will shine down into the mouth of the cave and will light up a rock at the entrance and highlight the couple. In order for me to get into position I had to wade through neck deep water with my cameras above my head hoping not to slip and drop my gear into the water which as you may know cameras don't like water too much. Once I got to the spot the bride and groom scaled the rock with help from a tourist passing by and they lit up perfectly. 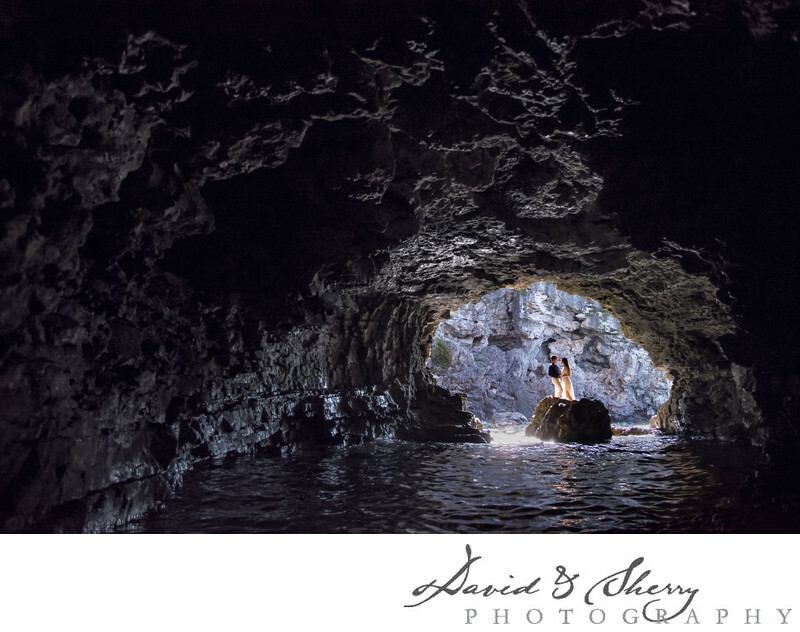 I love this wedding photo that was taken during a pre-wedding session with the texture of the cave and the romance which looks almost forbidden in this location. Wedding photography is all about looking for interesting angles in interesting places and this is one of my favourites and certainly the best photography we have done in Tobermory. Location: Northern Bruce Peninsula, ON N0H 2R0.